Cavallini lost his glove right in front of the net and the OSU defender chipped it into the OSU net. Tischke is called for roughing with 47.7 seconds left in the period. UW's Tischke gets a roughing penalty for hitting Joshua high after the whistle. OSU power play with 47.7 left in the first, leading 1-0. Tischke gets a penalty for roughing. Badgers back to the PK with 47.7 left in first stanza. OSU 1, UW 0. Buckeyes to the power play in final minute. Period comes to a close. 1-0 OSU, they also lead in shots 10-7. 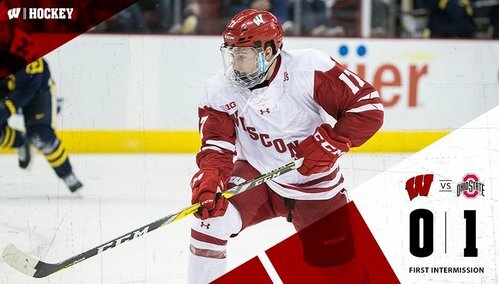 END 1: Ohio State leads Wisconsin 1-0 on a Mason Jobst power-play goal. Shots on goal are 10-7 for OSU. Badgers and Buckeyes back out for the second period. OSU leads 1-0 and will have 1:13 of power play time to begin the stanza. 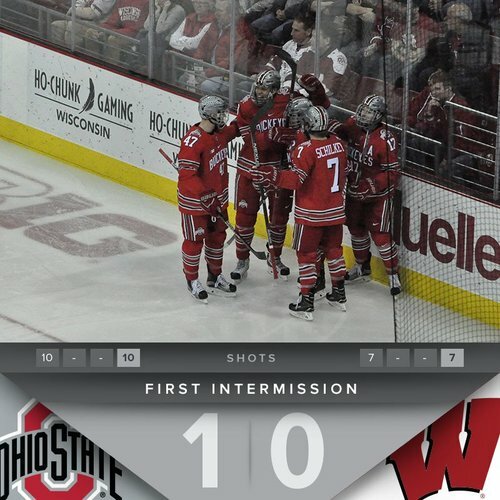 Ohio State has 1:13 of power-play time and a 1-0 lead over UW as the second period begins. UW kills off the Tischke minor and we are back to 5-on-5 hockey. Badgers have killed off the penalty. Time to see if UW has another big second period, like they've done all year. Greenway just lost his stick but Frederic, passing by, flipped it right back into his hands. Pretty fancy. Oh my Tomkins with a brilliant glove save on Ustaski. Jake Bunz has a good chance from a Ustaski feed, but Tomkins grabs it with the glove. Buckeyes ice the puck 5:09 into the period. UW still down 1-0. 5:09 in, and there has been one second-period shot on goal between the two teams. 14:16 left in the second. Ohio State leads UW 1-0. They just announced the women's hockey score and the crowd went nuts. Wagner and Moser pushing and shoving and both will head to the box for roughing. Coincidental minors assessed to both teams with 11:51 to go in the period. It will be 4-on-4 for two minutes. Ohio State 1, UW 0, 11:51 left/2nd. Teams will skate 4x4 after matching penalties. 4-on-4 after penalties to OSU's Moser (holding the stick) and UW's Wagner (cross-checking) behind the play. UW had just one shot on goal in the opening half of the second period. Six attempts blocked, two wide. 9:57 left 2nd, OSU leads 1-0. Teams are back to full strength with 9:51 left in the period. OSU still up by a goal. Tomkins swallows a shot in his padding and both teams are back at full-strength. OSU's Tomkins needs a mask repair for the second night in a row. Delay on the ice. Buckeyes score on the rush to make it 2-0 with 9:18 to go in the second. Kevin Miller scores on the odd-man rush and the Buckeyes lead 2-0. BUCKEYES GOAL: Kevin Miller scores on a pass from Joshua, and it's 2-0 OSU over UW with 9:18 left in the second. UW headed to the power play as the Buckeyes are called for boarding. Kunin slid a sleek pass to Frederic who was wide open in the slot but Tomkins with a strong save. Badgers now to PP after a boarding call. OSU's Weis is called for boarding. Badgers go to their second power play. Wisconsin gets nothing on the power play and then Jobst nearly scores on the other end. Nothing to show for the Badgers on the man advantage. 6:39 left in the second and UW is down by two. 8-3 in shots this period for UW. Yes, UW has just three shots with 6:39 left in the frame. Badgers may be getting a bit of momentum - after applying pressure, they will get another power play. Badgers get another power play as the Buckeyes get two for goalie interference. 4:11 to play in the period. Joyaux called for goalie interference. 4:11 left in second, 2-0 Buckeyes. Shots 20-11.